To address the threat of automation and the skills gap, Pearson, in collaboration with Nesta and the Oxford Martin School, has published the report The Future of Skills. Employment in 2030, a publication that identifies the skills and competencies that professionals will need to remain relevant in the —not so distant— future. In order to face this nightmare of widespread unemployed due to technological progress, Pearson, the world's leading education company, decided to take action and build a strategic alliance with Nesta, a charitable foundation dedicated to innovation, and the Oxford Martin School, a research center on global issues at the University of Oxford, UK. The result of this collaboration is the report The Future of Skills. Employment in 2030;2 a publication that advances the conversation beyond fear of automation and proposes a way forward by identifying the skills, abilities and knowledge areas that professionals in many sectors will need to remain relevant in the not-so-distant future. The report is available via an interactive website where its methodology, findings and implications, as well as a series of speculative profiles on future professionals can be found. The analysis does not only focus on measuring the impact of automation on the skills that will make one employable in 2030, but also explores six other megatrends that will shape which abilities employers will find valuable, namely: globalization, demographic change, environmental sustainability, urbanization, growing economic disparity, and political uncertainty. Critically, the study not only considers and quantifies the impact of these trends separately, but also charts the complex interactions that occur between them and which together will shape the employability landscape. Overall the study’s assessment is encouraging; it promotes a vision workers in symbiotic relationship with smart technologies. Education for the future will focus on developing the uniquely human skills and abilities for which, at least for the time being, the machines do not offer a viable alternative, such as empathy, personal interaction and group relationships. At the same time, there will be a greater emphasis on more dynamic didactic strategies. Constant education and retraining will be the norm, and university degrees will no longer be the main evidence of employability, as professionals will have to adapt to an ever changing technological environment in constant evolution. The results published for each region differ in the extent to which the panels of experts had different opinions about the professions analyzed. This goes on to show that the megatrends’ impact will differ from country to country, and serves as a warning for those who may be too eager to readily extrapolate the results to Latin America. 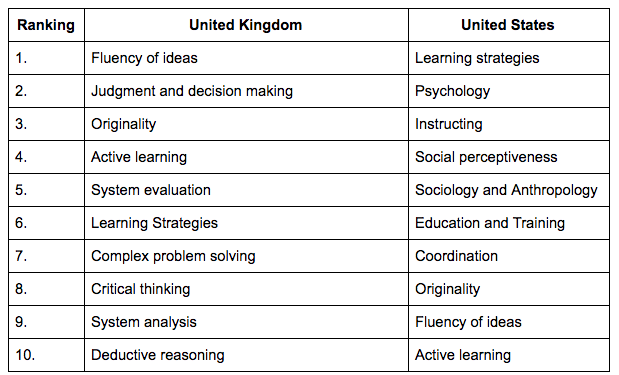 However, knowing what skills, abilities and knowledge areas will be most in demand in the US and UK may be indicative of the shape of things to come all around the globe. Table 1. The top ten skills, abilities, and knowledge areas associated with rising occupations confirm the overall importance of so-called 21st century skills, and point to those that will be in greatest demand. No matter how sophisticated predictive algorithms become, the future of employment and education will always be uncertain, but it is only through active experimentation and innovation that humanity can avoid the threat of obsolescence brought on by its own technological advances. 1 See Ford, Martin. The rise of the robots: technology and the threat of mass unemployment. New York, NY, Basic Books, 2015. 2 "The Future of Skills." The Future of Skills, Pearson, futureskills.pearson.com, Accessed on Oct 1. 2017. 3 The methodology and algorithms used are explained in detail in the technical report.